Photovoltaic Systems, LLC is a full-service contractor for solar electric systems. We site and install residential, commercial, and industrial solar electric systems in Central Wisconsin as well as solar electric equipment. Photovoltaic Systems has provided solar panels and installations to Wisconsin homes and businesses for almost four decades. Our services include site surveys, installations, maintenance, Schneider Electric inverter service, and consultation. 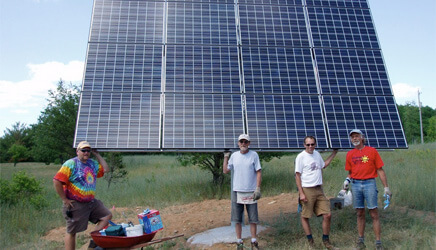 Our team members boast a combined 78 years working in renewable energy industry, and certifications such as: National Board of Certified Energy Practitioners (NABCEP) certified photovoltaic professionals, an SMA America Power Partner and a factory authorized service center for Schneider Electric power inverters. Independently owned and operated by James Kerbel since 1979; PV Systems currently employs 7 trained, experienced, technicians. Kerbel is also a founding member of The Midwest Renewable Energy Association and ReNew the Earth Institute. Over the years we have installed more than 1,500 solar systems in Wisconsin, throughout the Midwest, and in other regions. We also have supplied the individual components to many other installers and power producers.